Are you getting enough art and music in your life? Day-by-Day Highlights of Well 2017 here! 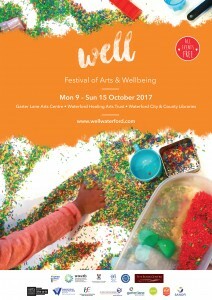 Well Festival of Arts and Wellbeing 2017 kicks off on Monday 9 October with a celebration of singing and art at Central Library, Lady Lane at 11am, and continues all week until Sunday 15 October with an exciting line-up of 36 fun, inventive and sociable arts events throughout Waterford City and County, for all ages, all entirely free. – Visual art exhibitions continue at Garter Lane Arts Centre, Central Library and UHW. – Visual art exhibitions continue at Garter Lane Arts Centre and UHW. The Well festival champions the health benefits of participation in the arts by everyone. Music, art, film, dance and literature, plus “Wellies”, a special programme of free events for children, are all on offer, so come, join in and Be Well! The festival is funded by the Arts Council, Waterford City and County Council and Sanofi, and is presented by Waterford Healing Arts Trust, Garter Lane Arts Centre and Waterford City and County Libraries.